Spring loaded car vent mobile phone holder attaches to air vent in your car to securely hold and mount your smartphone. Perfect for when you need to take calls, stream music and use your smartphone as a GPS. Ultra light weight means you can take travelling with you. Colours - White/Black Size - 100 x 28 x 48mm (LxHxD) Decoration Area(s) - Pad Print : 19mm Dia. ; 4CP Digital Direct : 19mm Dia. ; 4CP Standard Label : 19mm Dia. Made from quality ABS Plastic and UV Stablised High Impact Acrylic. Made in Australia. Suitable for all states. Custom printed car air fresheners are a great way for you to freshen up your marketing efforts without breaking the budget. 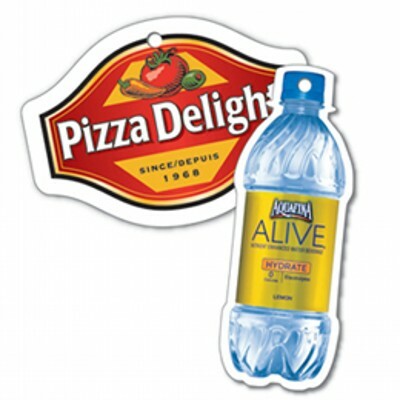 Promotherapy offers a good variety of sizes and options when it comes to promotional car air fresheners. For quantities below 2500 pcs, we have a huge selection of stock shapes to choose from, such as car shaped air fresheners or tree shaped air fresheners, with no die cut charges. And for quantities above 2500 pcs we can create custom shaped air fresheners with no die cut charges (design to fit within 80x80mm size). Individually poly bagged with hanging tie attached. Colour/Flavour/Fragrance: apple, vanilla, citrus, wild berry, cinnamon, strawberry and coconut. Pine and new car scent at an additional charge. Item Size: Shape to fit within 80x80mm area. Decoration Type: Screen Print / Full Colour Digital Print. Decoration Size: 80mm (L) x 80mm (W) - allow a 3mm bleed. Pen holder which clips securely to car air vents. It has a removable clip which is supplied unassembled. Colours: White, Black. Dimension: W 25mm x L 88mm x 26mm. Print Description: 8mm x 40mm or 10mm x 20mm (vertical). Print Type: Pad Print. Packing: Loose packed. Tool for measuring tyre tread depth with a handy key ring attachment. It is supplied with complete instructions for use and is an ideal safety product. Colours: White. Dimension: W 32mm x L 75mm x 6mm. (Dia 27mm ring). Print Description: Front - 55mm x 8mm or 25mm x 25mm. Print Type: Pad Print. Packing: Loose packed. Car power adapter with smash-and-grab raider, to be used to break the glass of the car door in case of an emergency. With 2 USB ports. Input: DC 12-24V, Output: DC 5V/2.4A. product_features : Ã˜ 2,6 x 6,4 cm. product_materials : Stainless steel. product_item_size : Ã˜ 2,6 x 6,4 cm. product_packaging_inner : 27. colours_available_appa : | black | silver . brand_name : The European Collection. Car safety tool with a steel point for shattering glass and a seat belt cutter. Features a Velcro attachment so it is easily fixed in place in any car. A production lead time of 10-15 working days applies to this product. Colours: White, Yellow, Black. Dimension: W 140mm x H 63mm. Print Description: 63mm x 12.5mm (two colour max). Print Type: Pad Print. Packing: Loose packed. Less than minimum quantities are not available for this item. MOQ applies per colour on this item. Three piece car wash set. Three piece carwash set in pouch; contains a sponge, a sponge with net and a microfibre towel. product_features : 26,2 x 24,5 x 8,5 cm. product_materials : PU, Polyester 600D, Microfiber 200g/m2. product_item_size : 26,2 x 24,5 x 8,5 cm. product_packaging_inner : 0. colours_available_appa : | yellow . brand_name : The European Collection. Alumina. Metallic barrel with silver head and keychain. When the tyre gauge is attached a measure drops down at the other end. Polybagged. Silver, Red, Blue. Product Size: 83Lx15W mm. Laser Engraved. Size: 5Hx30W mm. Metal. Metallic barrel with silver clip and head. When the tyre gauge is attached a measure drops down at the other end. Polybagged. BLUE, RED, SILVER. Product Size: 148Lx10W mm. Laser Engraved. Size: 5Hx50W mm. ABS (Acrylonitrile Butadiene Styrene). One end features a tough ABS plastic blade and ice chipper. The other end has a handy PVC window squeegee. Modern design with an easy to hold non-slip gripping area. White. Product Size: 203Lx102W mm. Hot Stamped. Size: 64Lx32Wmm each end. Plastic. Even on the dark side, you can scrape your ice or bugs from the windshield with this 3 LED scraper to light the way. Polybagged. Black. Product Size: 216Lx121Wx44D mm. Print. Size: 19Hx64W mm. Better safe than stranded. Healthy tyres can help keep you on the road and make your car perform better. This item comes with a clip. Polybagged. Black/Silver. Product Size: 146Lx16Wx13D mm. Laser Engraving. Size: 6Hx38W mm. Magnet. A soccer themed car sign magnet is a creative marketing idea for sport centric communities. If you're promoting a charity sporting game or a local sporting team, these eye-catching promotional displays just may help 'drive' brand recognition. Remove weekly for surface cleaning. Approximately 0.8 mm thickness and eco-friendly. Soccer. Product Size: 146D mm. Print. Size: 146D mm. Magnet. A tennis themed car sign magnet is a creative marketing idea for sport centric communities. If you're promoting a charity sporting game or a local sporting team, these eye-catching promotional displays just may help 'drive' brand recognition. Remove weekly for surface cleaning. Approximately 0.8 mm thickness and eco-friendly. Tennis. Product Size: 146D mm. Print. Size: 146D mm.